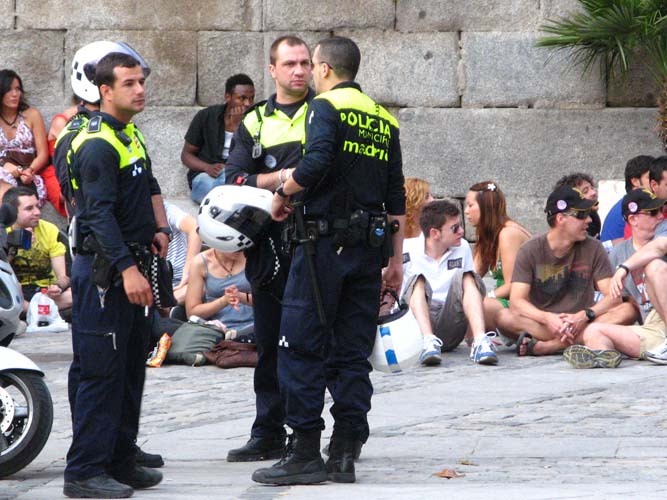 When he arrives in Spain and tries to socialize with the locals, the foreigner shouldn’t expect to be invited to their houses straight away, or ever. 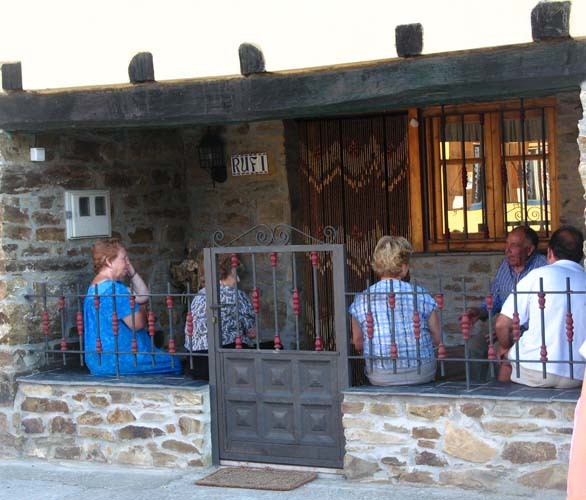 While it’s quite normal in northern Europe to invite friends home, it’s not the case here in Spain where most social meetings take place outside, in the neighbourhood, at the local bars. As a matter of fact, the street is the place where everybody goes to spend a social evening; and if you’re invited to join your Spanish friends, it’s very likely the place where you’ll meet them. 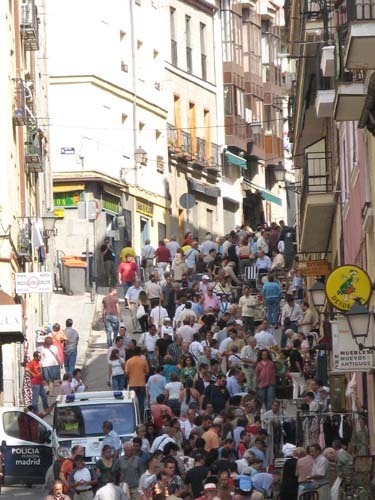 Consequently, the streets of Spain have this special ambiance that makes them one of the liveliest places I know. In the summer, the streets come to life at around seven o’clock, when the heat of the day is fading away and people are leaving their workplace. They are filled with crowds of strollers, from every age and social condition, who come out to enjoy the cool hours of the evening. 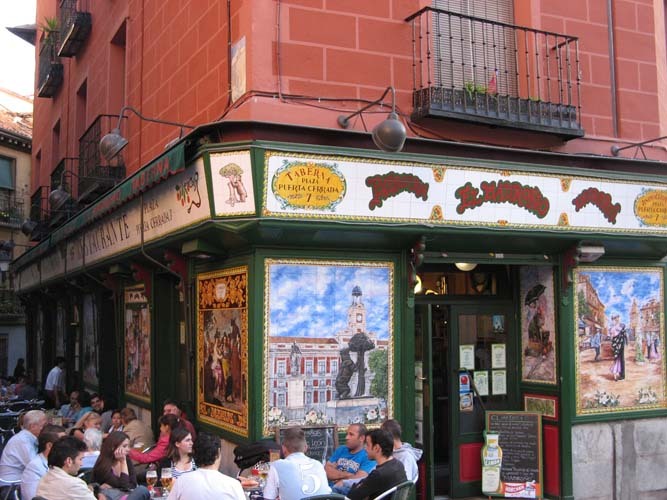 Stopping by a terrace of a café on your way home, having a drink with some colleagues or some neighbourhood friends you’ve met by chance, nibbling some tapas to kill the hunger, and arriving home very late at night, is a pretty typical pattern for a Spanish evening. At the weekends, the evening stroll becomes more like ‘going out’, although it follows the same pattern. 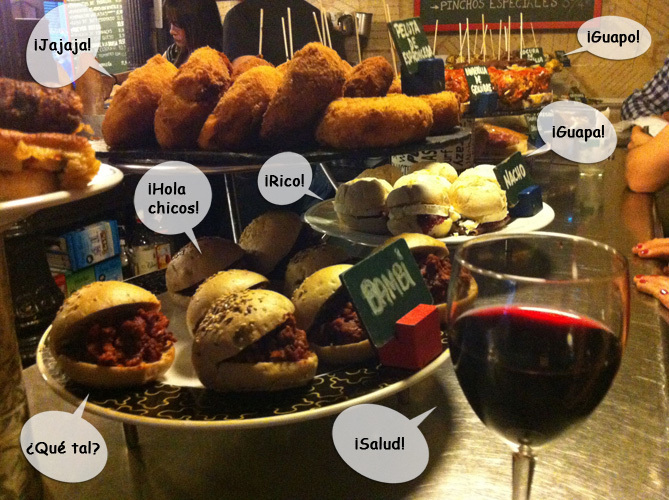 It’s then called ‘ir de tapeo’. That means gathering with friends to have a drink and a helping of tapas at one place, then go to another place for another round, and repeat the procedure endlessly, until closing time, when you’re finally satiated with booze, food and company. Due to the little time you spend in each establishment, it is unusual to sit when you’re going out this way; besides, these local bars have very few chairs and tables, or none, and you just have to stand up all evening, enduring this restless marathon with a stiff upper lip. However, there are some places where you can sit while eating and drinking, and stay for a longer period of time; the terraces of cafés, for example. These are packed full with every kind of people, but particularly with families. While the parents are chatting enthusiastically, their kids are playing around on the square, screaming, running with a ball, until some ungodly hour when everywhere else in northern Europe neighbours would call the police to report a disturbance of the peace. Some old people bring their chairs from inside their house and sit themselves comfortably on the threshold to watch people strolling by. Youngsters generally prefer to sit on the ground, around the one-liter bottle of beer they’re sharing; these meetings are called botellones and, despite being forbidden by law, they’re extremely popular and massively attended. Every local bar is equipped with a TV set. Men particularly love watching their favourite football team playing, and arguing about the players; whereas women prefer soap operas and gossip programmes, which give them the chance to comment on the celebs, such as TV stars, singers, famous bullfighters’ wives, etc. I personally believe that gossiping is one of the favourite national activities. Both men and women enjoy talking about the way someone looks, the house someone else bought, whats-his-name’s new partner or the so-and-so’s latest swindle… all these topics of conversation fill the bars, terraces and streets of the neighbourhood, as if everybody knew everybody, and the whole place was like a little village. As a foreigner, you can have a great time in the streets of Spain. The ambiance is awesome and most Spaniards you meet will be friendly towards newcomers. Hardly have you been introduced to a group than they’ll treat you as if you were one of them. 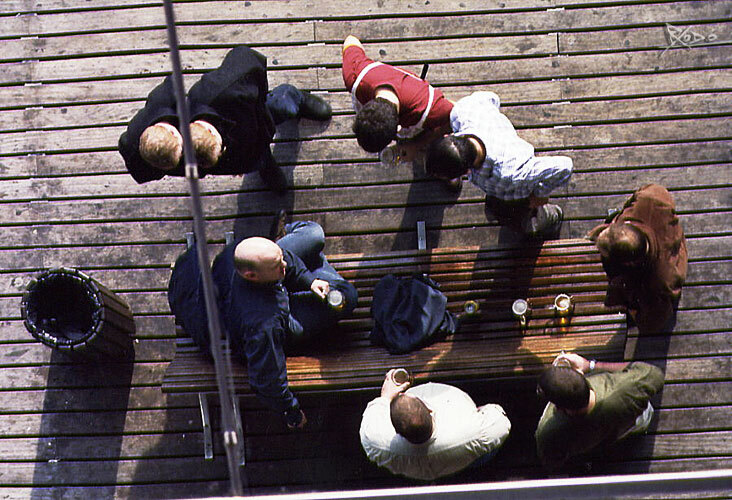 They’ll invite you for drinks, share some tapas and ask you to join the conversations, whatever language you speak. At the end of the evening, when it’s time to part, these brand new friends will hug you good bye, men slapping you vigorously on the shoulder, girls kissing you warmly on the cheeks; and all of them promising to meet soon again. ‘Hablamos mañana’ they say wholeheartedly. Although their intention is genuine, it’s very likely they’ll never call you tomorrow; and if you’re lucky enough to stay in touch with them, you’ll probably never be invited to their house either. However, you’ll always be welcome in their neighbourhood. This is the way Spaniards show their hospitality: their nightlife makes their streets feel just like home.